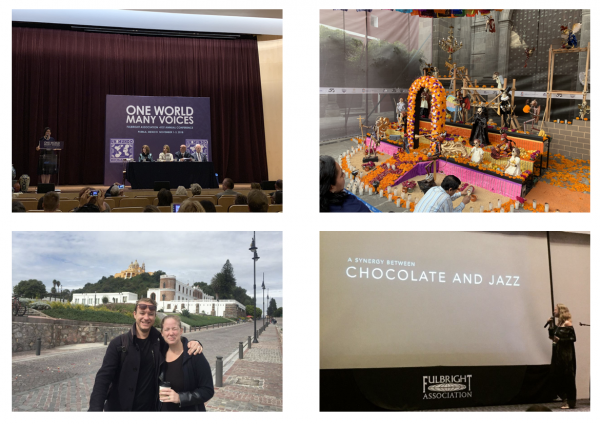 Here are a few pictures of my trip to Puebla, Mexico for the National Fulbright Conference. There were around 400 super inspiring people from all over the world, specializing in different fields of work. I did a 10-minute plenary talk about the synergy of chocolate and jazz. My talk contained different listening examples of my improvisations and I made the audience guess within different categories what the sound example represented. “What color is this sound-bite“, or “what texture“, or “what would be the weather“, or “what is the emotion“, or what is the”flavor of this sound-bite“. It was remarkable to see that in almost all the examples was a unanimous answer in the audience. I really loved it because I felt it really described the process I go through when I’m live, improvising and composing while in the moment. Many things can inspire me to make certain sounds, or use certain apps or chors, rhythms and obviously, there are always different versions possible. Take for example the different shades of colors, like purple, which might be very close to what blue would sound like. Better said, in a 15-minute composition that is supposed to sound blue, there might be moments that might sound purple. Anyway, it was very fun to explain what we are doing with ChocoJazz; exploring new ways to express our art and even discovering a new genre in performance arts. Puebla was a wonderful city and it was also very fun to be there for the ‘day of the dead’ celebration. After the conference – since Teddy was able to tag along – we decided to explore Mexico City for a couple of days and had an awesome touristy time before going back to New York.